Cut the sharp points off the artichoke leaves with kitchen shears. Remove the small, dry outer leaves from around the base of the artichoke. Cut off the stem 1 inch from the bottom of each artichoke. Soak the artichokes in cold water for at least 15 minutes to clean them. Place the artichokes upright in a large pan with about 4 inches of water, lemon slices and olive oil. Cook them on medium heat for 30 to 45 minutes, partially covered, or until the leaves pull off easily. Bring the artichokes to room temperature and then cut them in half. Scoop out the choke of the artichoke with a teaspoon and discard it. Place the artichokes in the refrigerator. Just before serving, arrange the halves on serving plates and spoon a couple of tablespoons of sauce into each half. Here are two sauces that can be used on the artichoke. They are NOT meant to be used together. In a small mixing bowl, combine the shallot, mustard, lemon juice, vinegar, basil, chives and parsley. Whisk to combine and slowly add the oil until it is incorporated. Season with salt and pepper. Place the vinaigrette in a tightly covered container and refrigerate. Remove it a half hour before serving to thin the dressing. Add the garlic cloves to a food processor fitted with the metal blade and process until they are pureed. Add the red pepper and process until it is well-blended. Add the mayonnaise and process. Add the salt, pepper and cayenne, and taste for seasoning. Refrigerate the sauce until serving time. Just before serving, arrange the mixed greens in the center of a large circular platter. Cut the tomatoes into 1 1/2-inch slices and arrange on a platter in a circular pattern overlapping. Relish and dressing may be made up to 2 hours ahead, covered and kept at room temperature. It is best to finish this just before serving. Double the recipe. Use a very large platter or 2 platters. Arrange the salad in stacks. 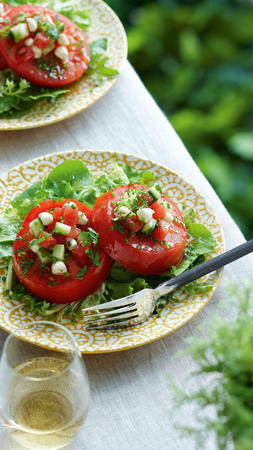 Place a slice of tomato on the bottom of a salad plate and then a dollop of relish. Repeat 1 more time. Heat the oven to 250 degrees. Cut away and discard the crust from the loaf of bread and cut the loaf in half lengthwise. Bake for 5 minutes on each side. Let cool for 10 to 15 minutes. Raise the oven temperature to 350 degrees on convection heat or to 375 degrees in an oven without convection heat. Cut the bread into chunks small enough to fit easily in a food processor. Place them in the food processor and pulse until you have fairly even crumbs that are not too fine. Set aside 1 cup of crumbs and reserve any extra for another use. Finely chop enough parsley leaves to measure about 2 tablespoons. Peel and finely chop the garlic. Put the parsley, garlic, bread crumbs, capers, salt and olive oil in a mixing bowl. Mix well until the ingredients are evenly distributed and the bread crumbs are well coated with the olive oil. If there doesn’t seem to be enough olive oil to coat them, add a little more. Cut the tomatoes in half crosswise and scoop out the seeds. Place the tomatoes, cut side up, on a baking sheet. 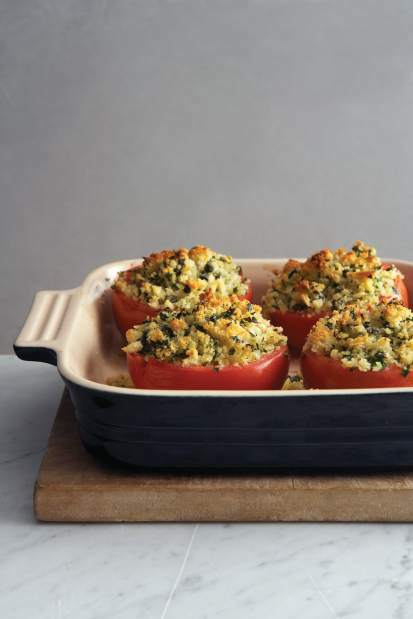 Fill the cavities with a generous amount of the bread-crumb mixture, heaping it on top of each tomato half. Bake until a brown crust forms, for about 20 minutes. Serve hot, or at room temperature. Select tomatoes that are vine-ripened for the best flavor. Remember to store tomatoes at room temperature. If they are not quite ripe, store them in a sunny place to hasten ripening. Tomatoes vary widely in the amount of juice they exude, so add a bit of water if you find the pan is dry during roasting. Roasted tomatoes can be made as much as 8 hours ahead and kept at room temperature. Serve at room temperature, or reheat in a 325-degree oven for about 10 minutes. 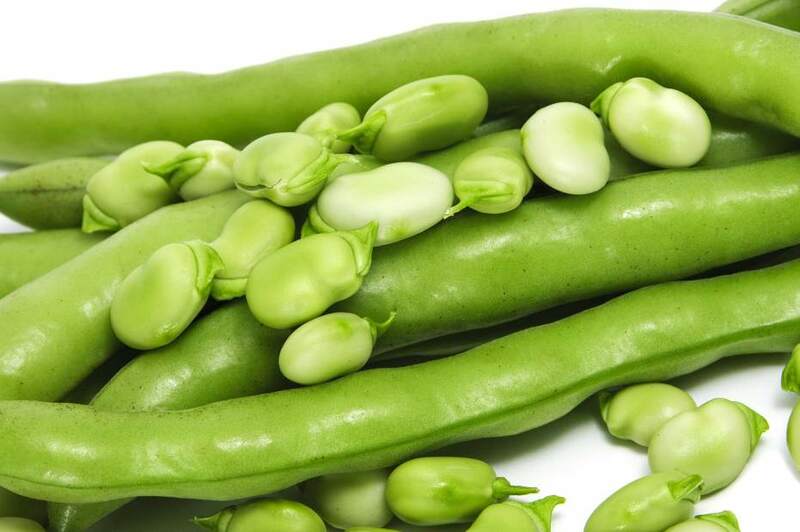 Shell the fava beans by removing them from the pod. If the beans are young, they might not need to be skinned after shelling (the skin feels spongy); if they are older and larger, the outer skin should be removed, as they make the beans tougher. Place shelled beans in a medium-size saucepan. In a medium-size skillet, cook the bacon on medium heat until crisp. Drain the bacon on paper towels and cool. Crumble the bacon into tiny pieces and reserve. In a medium-size skillet, heat the oil on medium heat and saute the onion slowly for about 10 minutes. Add 1 teaspoon of the vinegar and continue cooking until the onions are light brown and just begin to caramelize. Reserve in the pan. Cover the beans with water by 1/2 inch, and bring them to a simmer on medium heat for a few minutes or until tender, anywhere from 2 to 5 minutes, depending upon how large they are. When the beans are cooked, add them to the pan with the onions. Add the bacon, reserved vinegar, parsley, salt and pepper, and cook on medium heat, mixing to combine. Taste for seasoning. Spoon into a bowl and serve immediately. The fava beans might be shelled for 8 hours ahead, and the dish might be prepared through step 3 as long as 4 hours ahead and kept at room temperature.